What a glorious morning! It’s so cool that I opened all the windows last night. 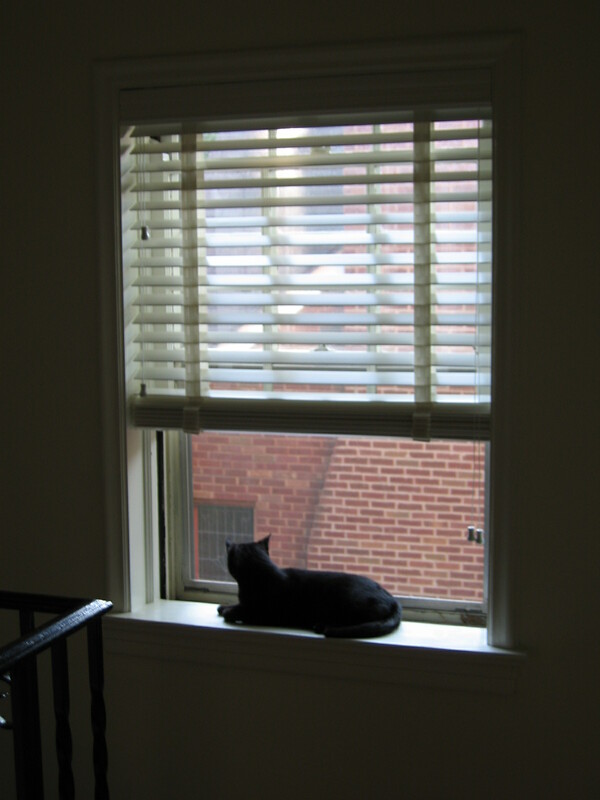 Kitten Britches enjoys the new vistas. Birds are singing like I haven’t heard in weeks. In the news: The formerly-French-door-to-nowhere now has a deck outside it, with steps down to the yard. We let Kitten Britches out on Saturday morning while we ate breakfast there. She was nervous, as cats will be in unfamiliar circumstances, having been an indoors cat now for over a year. Nonetheless she went down into the yard and behind a bush and shortly thereafter we heard the death squeak of a vole she had caught and killed within 5 minutes of being outdoors. Some skills don’t die quickly, I guess, and Mom-Cat taught her well how to hunt. But that sealed Britches’ fate- an indoors cat she will remain, despite her howlings and wailings now at the French Doors, longing to exercise her reawakened predatory instincts. I’m afraid my will must prevail on this one- we have too many lovely birds and young rabbits in our yard to unleash this furry little killing machine. Hopefully this howling will extinguish before too long! This entry was posted in birds, cats, Uncategorized. Bookmark the permalink.